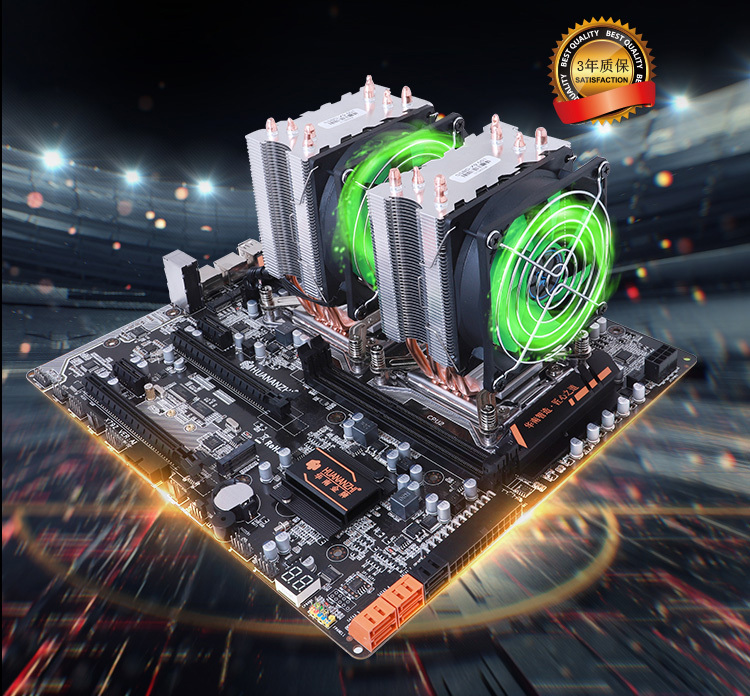 >> Due to different production batches, our motherboards may probably have slightly different design, such as different color of memory slots, different position and color of SATA ports, different motherboard versions etc,..... They dont have any function difference. Pls in kind prevail, HUANAN company will not make any further notice. 1: What in the package? ​If you need CPU coolers, pls contact. 2: Why is it better for buyers to shoot an unpacking video when they get their packages? Some buyers said that there is product missing when they opened their packages, then showed us some pictures, however, pictures can not prove anything as everybody knows, the best evidence is an unpacking video, so pls do it, which can help a lot if you happen to be in the same situation above, WUSON store does not accept pictures as evidence!!!!! Thank you for understanding. 3: All products are tested before shipping? 4: How are the products packed, will they be intactly delivered? 5: Will all packages be surely delivered within the time set by Aliexpress? Surely not. The most intangible thing is transportation, the majority of parcels can be delivered within the required time, but nobody can guarantee that all parcels can be delivered within the time, sometimes some parcels are delayed with specified reasons such as bad weather/holiday/post office staffs strike/custom clearance delay etc. Sometimes there is no any reason. Pls refer to the "delivery time announcement" below. So pls think about it before you make order, as long as you make order, that means you understand everything above. 6: Do buyers need to send products back if they dont work or stop working? WUSON store does provide 100% genuine warranty service, and we have all the power to determine whether buyers need to send products back to us or not. But that does not mean our products are unreliable, in fact as we state in statement 3 above, we strictly test ALL our products before shipping without any doubt, so normally the great majority of buyers are satisfied with our products and some of them have become our regular customers. Besides, according to what we experienced before, many our products worked fine after they were sent back by buyers, but they did not work when buyers tested them, that\'s pertty weird, moreover, some buyers sent our products back without any additional protection, they just put our motherboards in the original box, then put the box in a mail bag without any bubble protection(many buyers know we wrap our motherboard and box with much bubble and put our motherboard original box in an external cardboard box), but the products still worked fine after a long journey, I think we dont need to explain too much on it. >> If our products dont work the minute when buyers get them or they stop working within half a year from the time buyers make order,the answer is 100% YES. Especially the time when buyersjust get them andstart testing. WUSON store has all the power to ask buyers to return products either for exchange or refund. 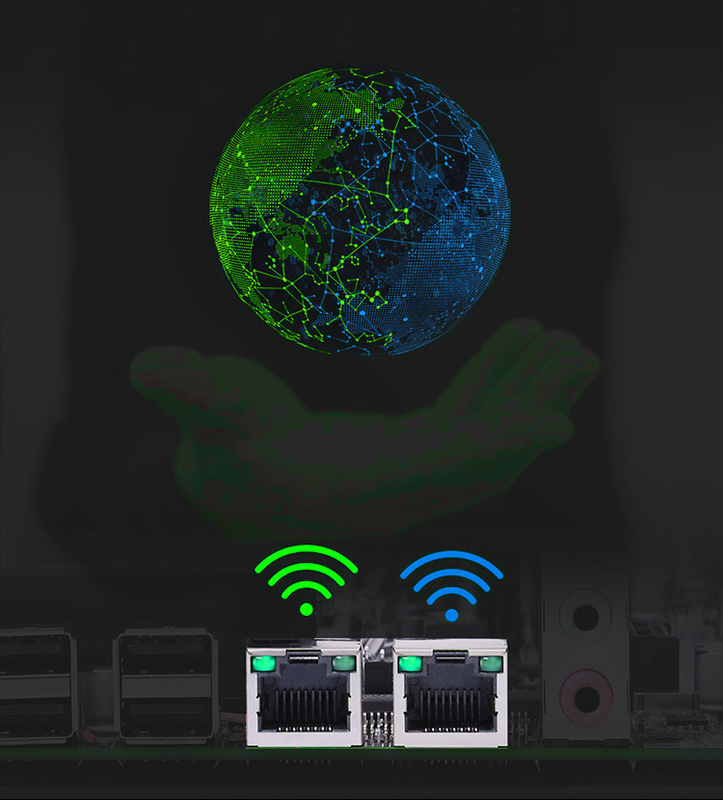 >> If our products stop working after it has been in use for more than half a year, the answer is uncertain. WUSON store would evaluate the products condition first according to the evidence buyers provide, then make decision of whether we need buyers to send it back or we directly send another one out. ​Dear customers, if you make order at WUSON store, it means you 100% agree on these statements above. 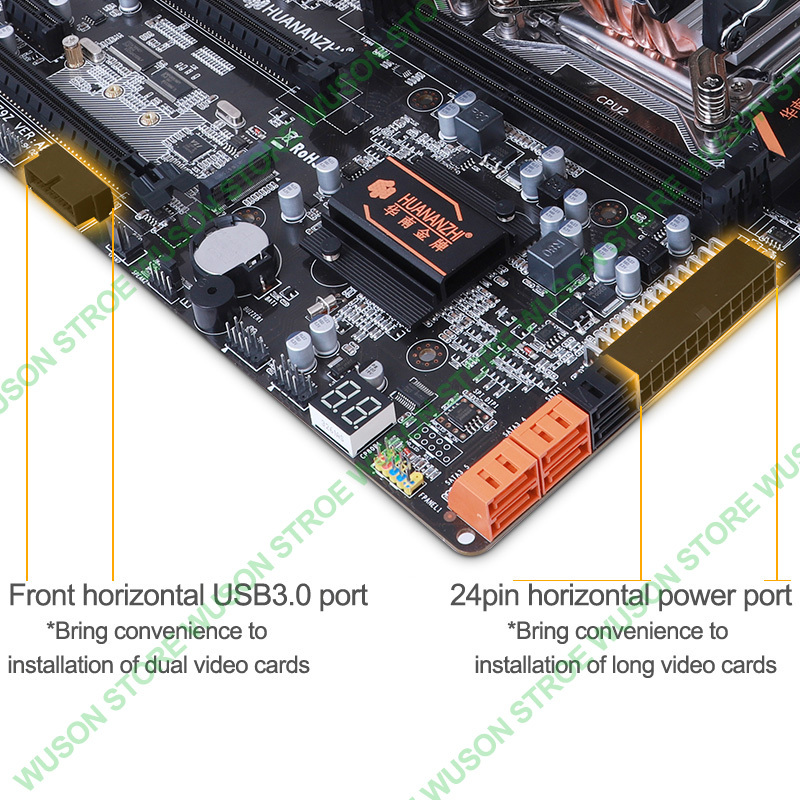 1: What is the motherboard version? 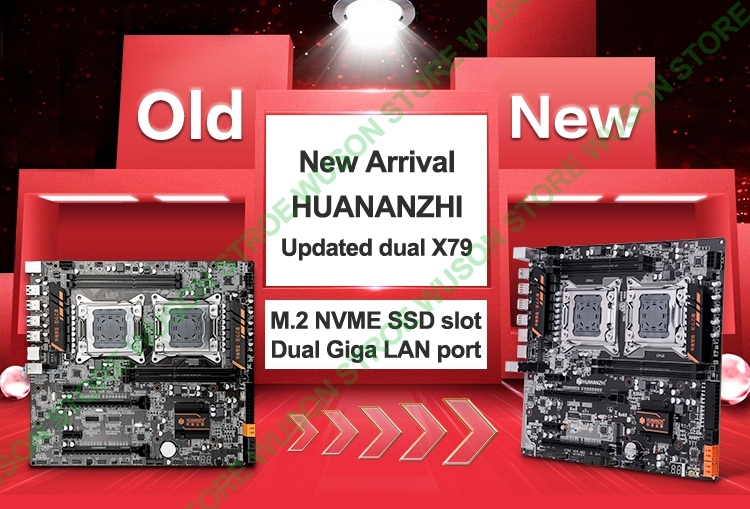 The motherboard version is not always the same as the manufacturer would update it every now and then, so the motherboard version varies from time to time due to different production batches. ​WUSON store normally would ship the latest version, pls in kind prevail, we will not make any further notice. 2: Why is there no image display on the monitor? 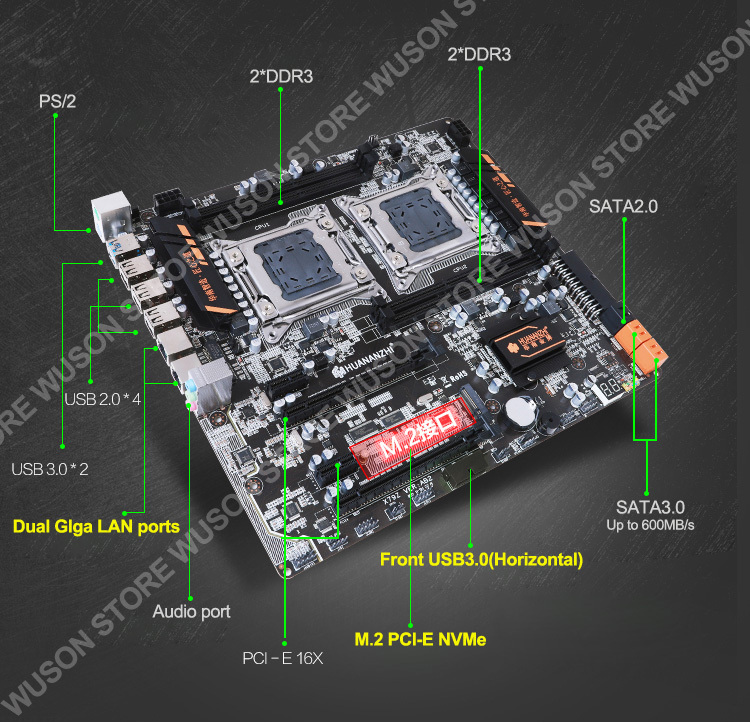 Pls firstly check whether the motherboard speaker beeps or not, if it beeps, it must be the video card or monitor problem, if the speaker does not beep, then pls check whether the CPU cooler spins or not, whether the LAN port light is on or off? 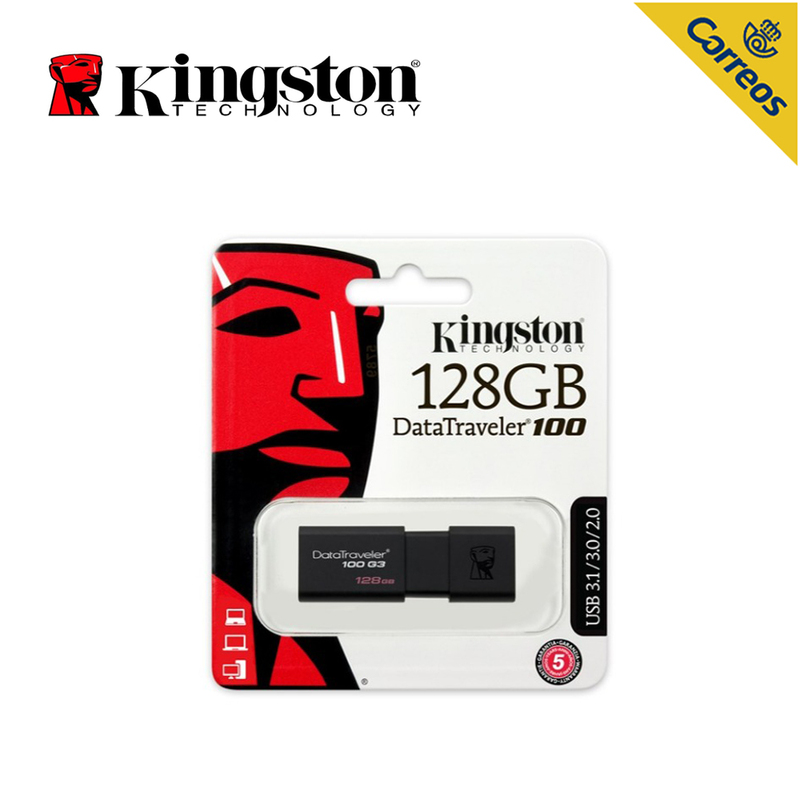 If it spins and the LAN port light is on, its still the video card or monitor problem, but if the LAN port light is off, pls wipe all memory sticks with eraser, and then install only ONE memory stick in any one of the memory slots, start the PC. 3: Do motherboards support overclocking? Do they support SLI and Crossfire? 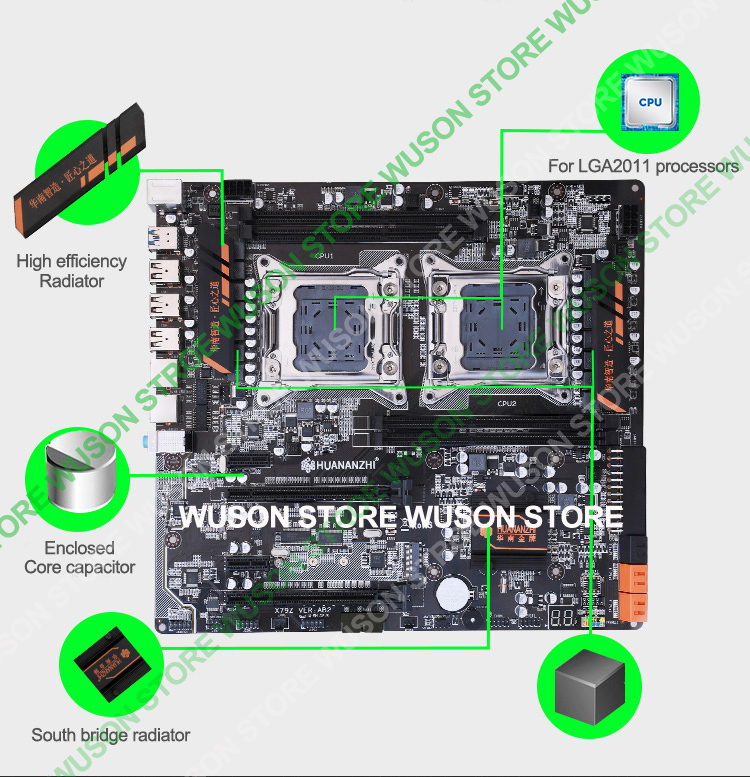 Responsibly speaking, WUSON store does not recommend buyer to do overclocking, which would probably bring damage to hardware, so of course we dont test overclocking and we also dont have BIOS version that supports overclocking, but some buyers said that they did overclocking on our X79 motherboards after flashing BIOS. X58 boards dont support overclocking but turbo boost. 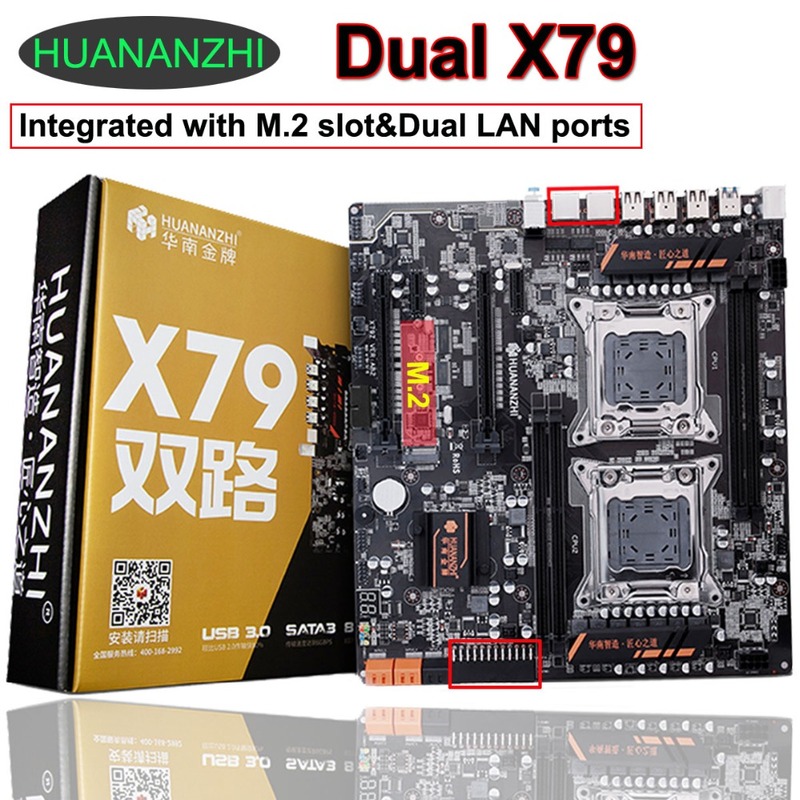 Only HUANAN ZHI deluxe X79 board supports Crossfire. 4: Why does the motherboard temperature sensor sometimes work abnormally? 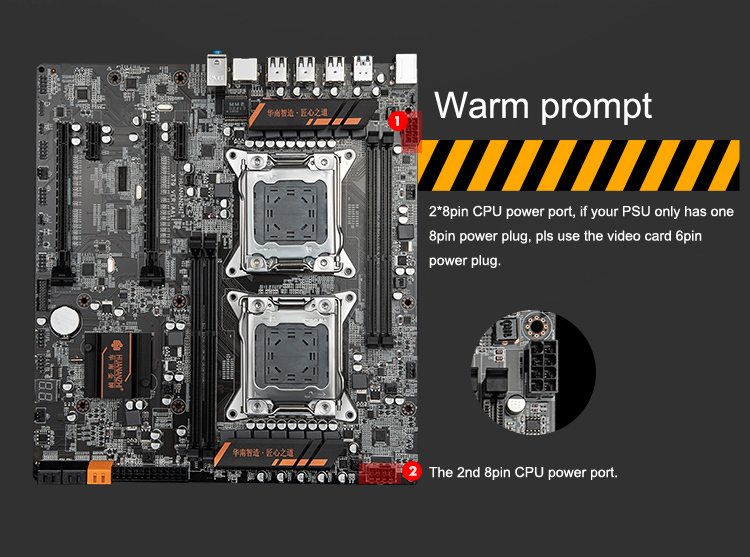 Yes, sometimes the motherboard temperature works abnormally, so it gives wrong temperature information on motherboard and CPU, but actually motherboard and CPU are not that hot, otherwise your computer would automatically shut down. HUANAN company technicians are still working to figure it out. 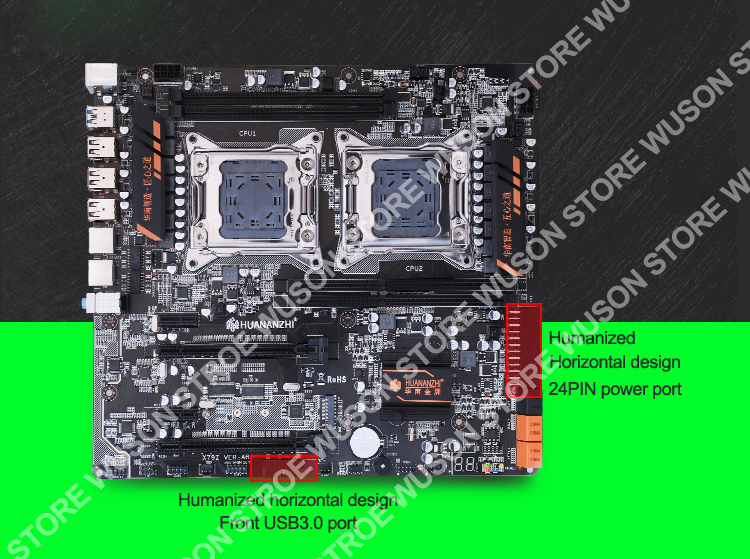 5: Does the motherboard work with 2 different processors simultaneously? 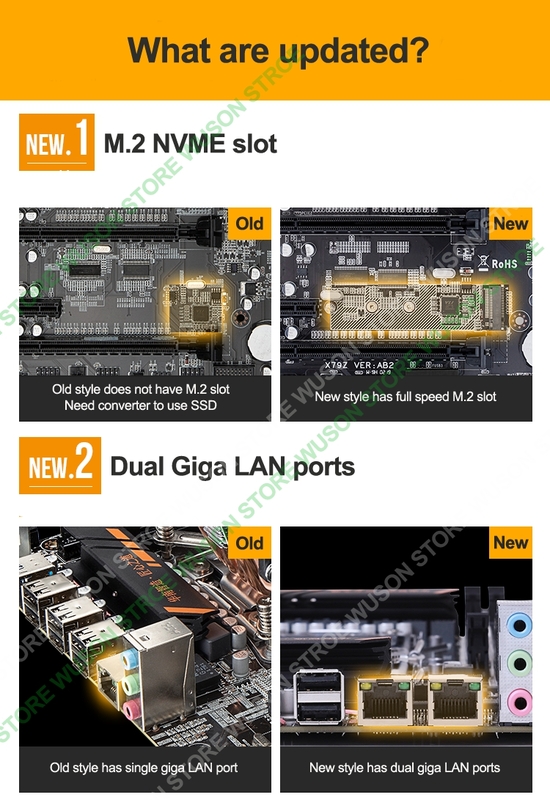 The answer is No, all dual CPU motherboards only support 2 same processors working simultaneouly, so this motherboard only supports 2 same processors like 2*2670/2*2680 V2 etc. Of course the motherboard can work with only one processor, but in that case, only 2 memory slots work. 6: How to power on CPU if your PSU does not have 2*8pin power cables? 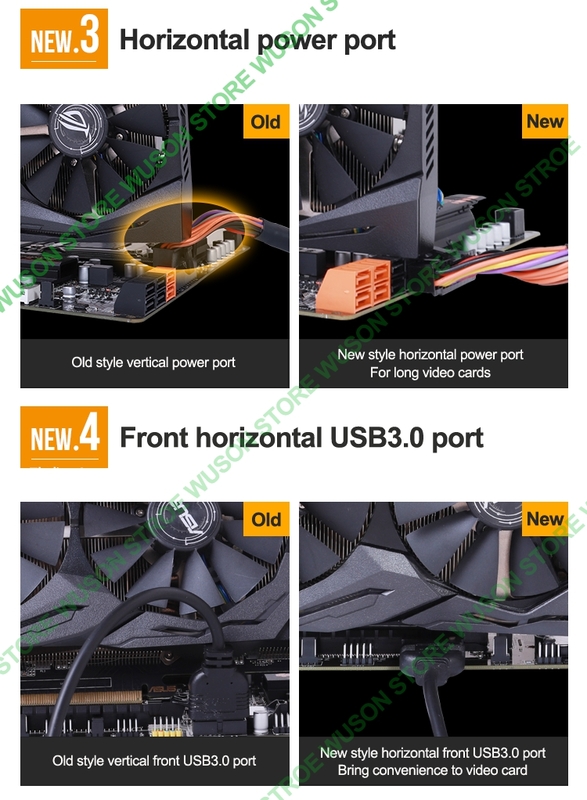 There are 2*8pin ports respectively for 2 processors, so if your PSU has 2*8pin cables, everything will be perfect, but if it has only one 8pin cable, pls plug this cable into the 8pin port that is farther to the PS/2 ports, and plug a video card 6pin cable into the other 8pin port, let the clip of the 6pin cable be reversed in the port. 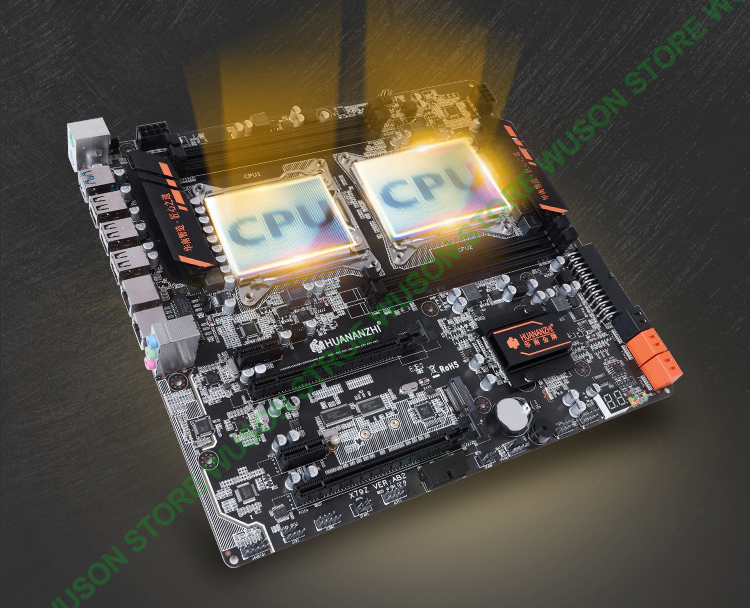 4: WUSON store does not sell Core i7 series processors, so we did not test it on our motherboards, so we must responsibly make a statement here: we are not sure whether the Core i7 processors can work on our motherboards or not. 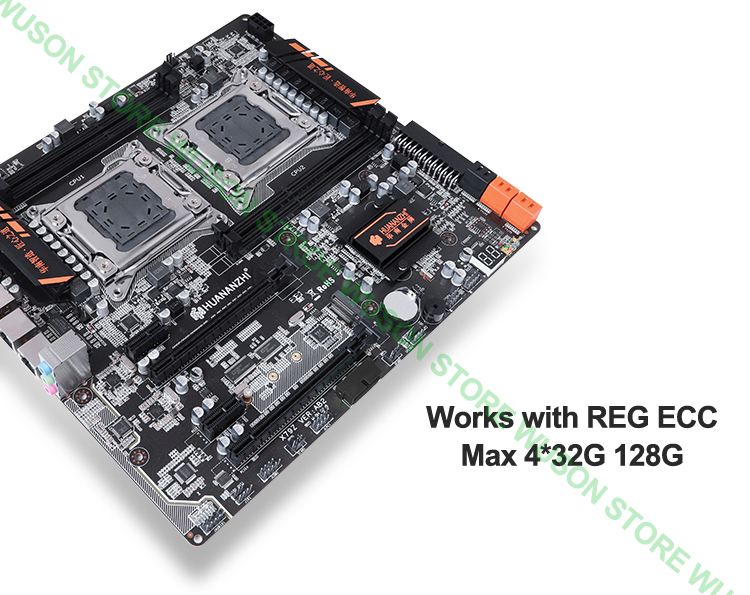 One thing you need to know: if you use i7 processors to test, pls do not use REG ECC. 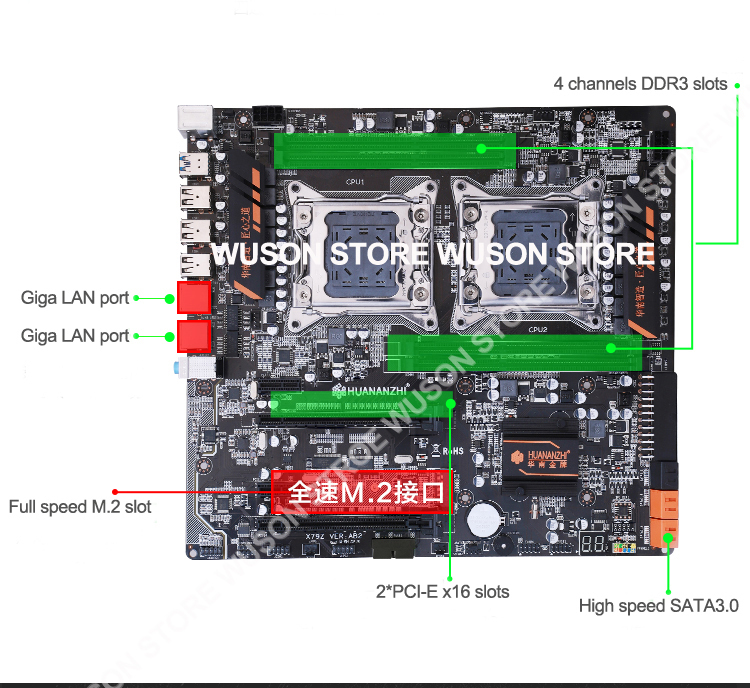 5: WUSON store puts a driver disc in each of our motherboard box, its no doubt, however, some buyers said that there is no driver disc in the box, so WUSON store is sure that the disc must be removed by destination country custom, pls contact us and leave us your email if there is no disc in your box, we will send driver to you. 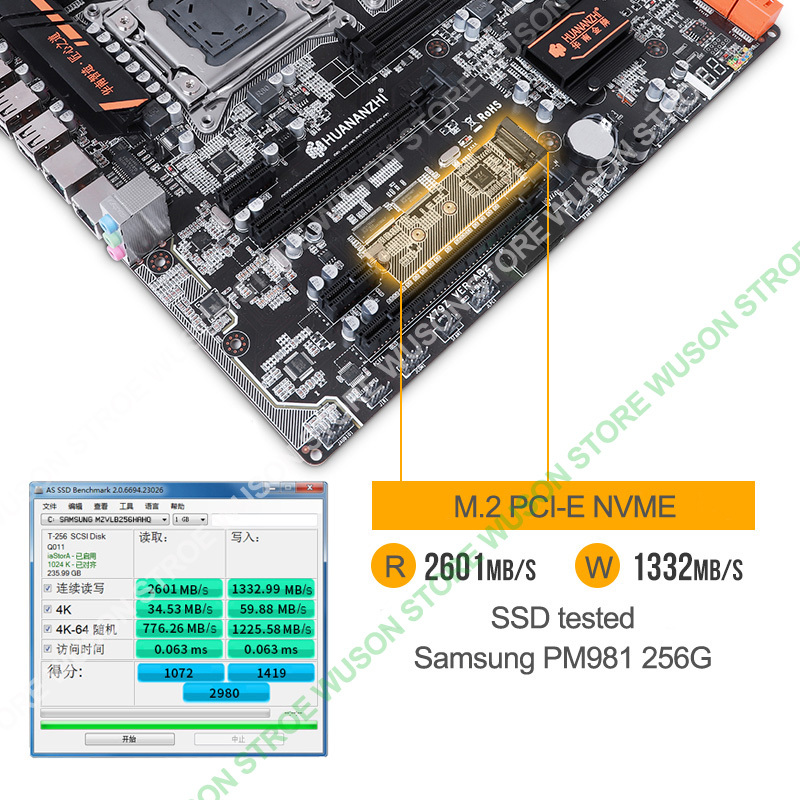 6: All RAM in WUSON store is 2RX4 DDR3 REG ECC 1333/1600/1866MHz, so we only tested it with 2RX4 DDR3 REG ECC(1333,1600,1866 all ok), as for other RAM models buyers mentioned, such as 4RX4 or 2RX8 or others, we did not test them on our motherboards, so responsibly speaking, we are not sure whether they work ok or not with our motherboards.